The movie will be filming in the Lexington Kentucky area as well as other areas of Kentucky this summer and is looking for many Lexington locals who would like to work as background extras on the project. The upcoming feature film is a period piece set in the 70s and adults, ages 18+ to fill many non-speaking roles. Casting Director Taylor Woodell (“The Death of Eva Sofia Valdez,” “The Inspectors“) is now accepting submissions for the film. The film is set between 1970 and the mid 80s so they are seeking folks in the area who have non-modern looks and would be able to pass as actually being in those decades. So… no modern haircuts, piercings, tattoos, etc. The casting team is especially interested in those with any law enforcement training or background. 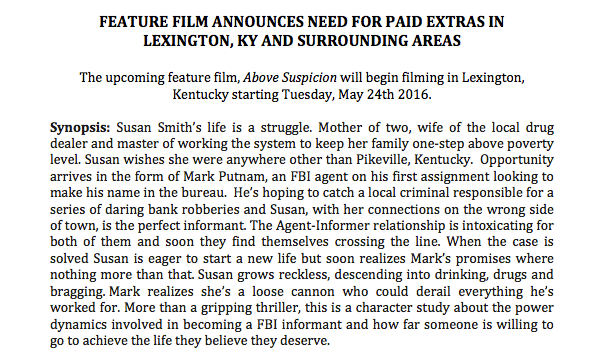 “Above Suspicion” will begin filming in Lexington starting May 24, 2016 and going into June. “Above Suspicion” stars Emilia Clarke and Jack Huston. According to various local news sites, the film is based on the story of FBI agent Mark Putnam and a Kentucky woman who became his informant. Putnam received national attention when he confessed to killing his pregnant informant girlfriend in 1989. He went to prison and was released in 2000 after serving 10 years for killing his girlfriend. Interested in being an extra on “Above Suspicion?” See the flyer below and e-mail a recent photo of yourself, along with your age, height, weight, wardrobe sizes, a description of any tattoos and your location to abovesuspicionextras@gmail.com.